The Perfect Home Facial - Professional Applications! Contains... 4% SHEA BUTTER - FRAGRANCE-FREE! 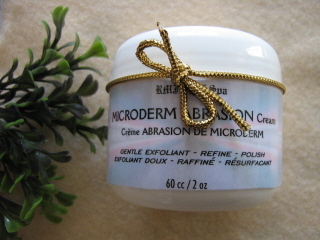 The technique of Microderm Abrasion is a controlled projection of micro-crystals that smooths out surface defects! It generally known to work on wrinkles and fine lines, pigmentation spots, acne scars, dull complexions and stretch marks. No recovery required, as it is a non-invasive and non aggressive treatment of cosmetic procedure. Whole body cost (majority of spas) - $600-1,200! Microderm Abrasion Therapy is recommended for all skin types. Allows skin to detoxify whereby removing old, dead skin. Stimulates collagen and elastin production to increase cellular renewal of new skin. Used in spas to eliminate the top layer of the epidermus - bringing newer skin to the surface. This method removes the old layer of skin by polishing or acting as an abrasive to remove imperfections and fine lines. Contains the exceptional natural ingredients of Avocado, Jojoba, Hemp, and Grapeseed oils - PLUS 4% Shea Butter and Vitamin E! Instructions included.